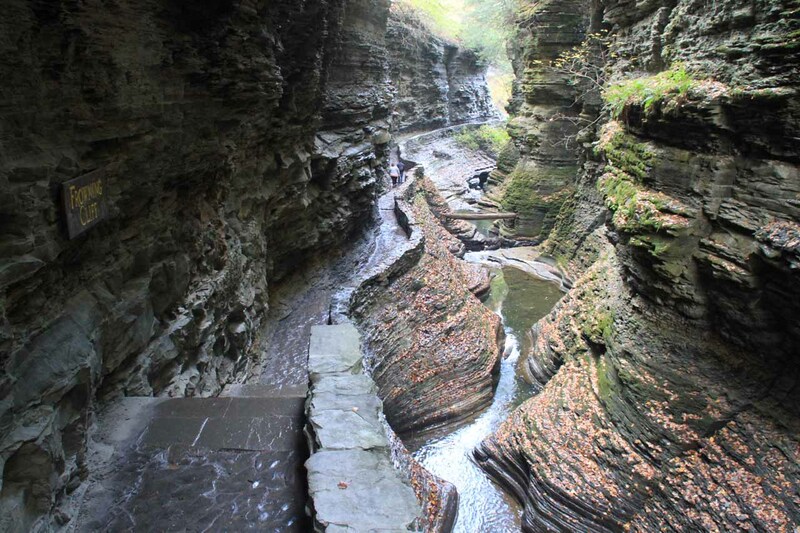 The Watkins Glen Waterfalls were merely the excuse for me to visit the Watkins Glen itself, which was said to be the most scenic of all the glens in the Finger Lakes region of Western New York. 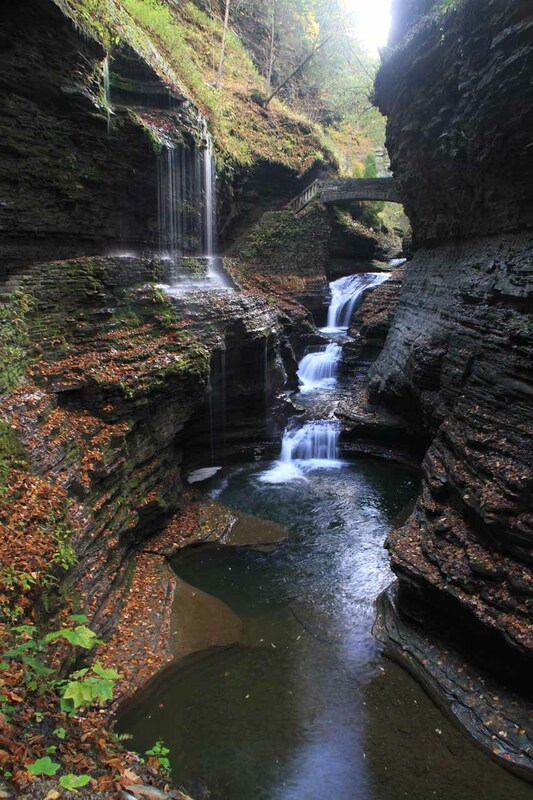 Little did I realize that the waterfalls within the glen themselves more than held their own as side attractions (and believe me, there was definitely no shortage of side attractions in this glen!). In fact, some of them (such as Rainbow Falls, pictured at the top of this page) could have easily been waterfall attractions themselves had they not been clustered about in this popular and famous glen by Seneca Lake. 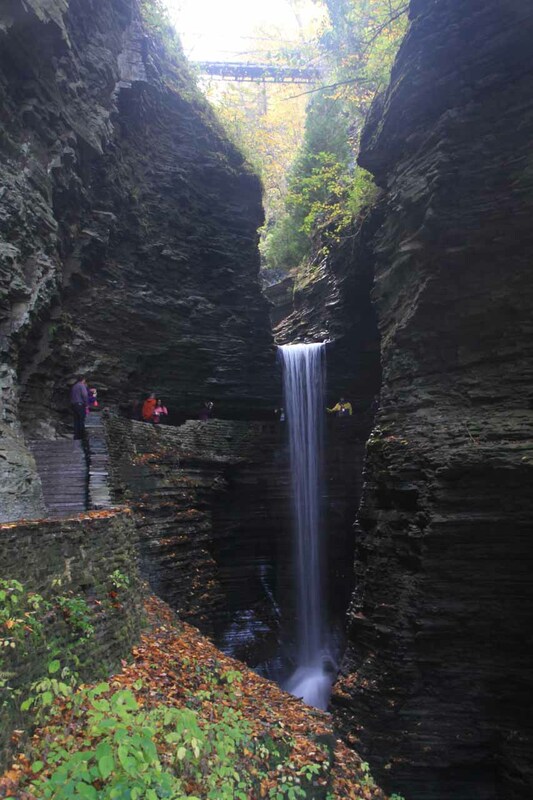 Within Watkins Glen, I noticed at least four named waterfalls – Cavern Cascade, Central Cascade, Rainbow Falls, and Pluto Falls. 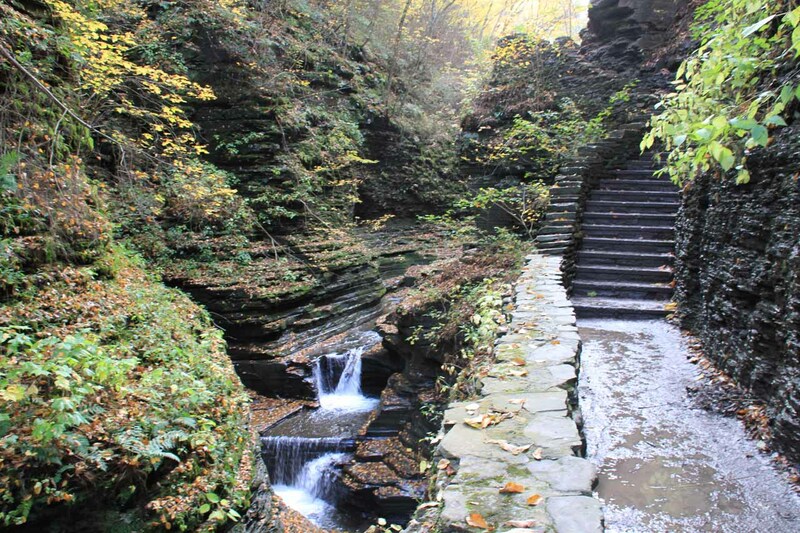 There were several more cascades along the Watkins Glen, including a loud and mostly hidden one by the Sentry Bridge by the Main Entrance at the far eastern end of the park. 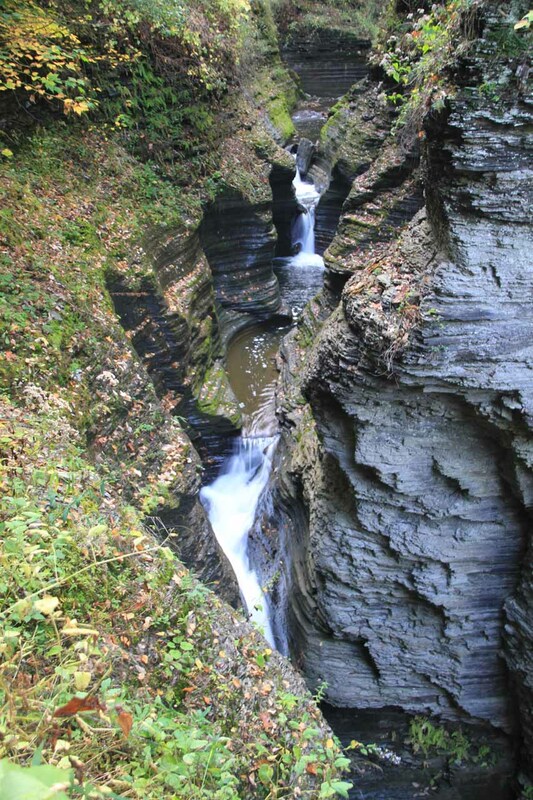 This side of the glen was where the Glen Creek flowed past the mouth of the glen and continued beyond the southern end of Watkins Glen Village. Although there were many options for doing this hike (including the most popular one being a suggested-in-the-literature 3-mile loop going up the Gorge Trail, which passed within its depths, then hiking back out on the Indian Trail from the rim of the gorge), I opted to do an out-and-back hike strictly within the gorge on the Gorge Trail. I started at the car park at the mouth of the glen (see directions below), then hiked all the way to the Mile Point Bridge before turning back the way I came. 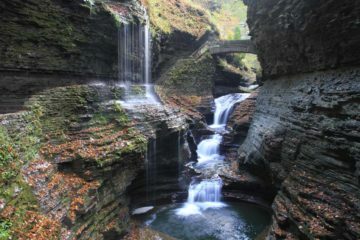 Theoretically, it was only a modest two-mile round trip hike without too much elevation gain and loss, but I ended up taking over 2.5 hours total because literally almost every step within the Watkins Glen yielded photo ops of not only waterfalls but just the overall scenery from within the glen itself! The adventure started as I entered the Gorge Trail from the car park at the mouth of the glen. There was a lit up tunnel at the far end of the car park. The tunnel then curved towards the Sentry Bridge, where I was able to look down at a hidden cascade that didn’t seem to have a name. Beyond the bridge, I continued up a series of several steps that quickly brought me higher up the gorge while skirting around more cascades. 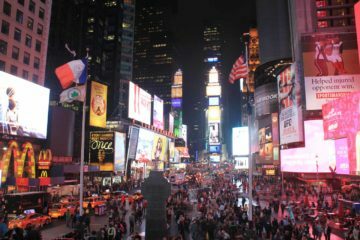 It was in this stretch that I immediately sensed that just about every moment I decided to pause, there would be a photo op that I never considered before. 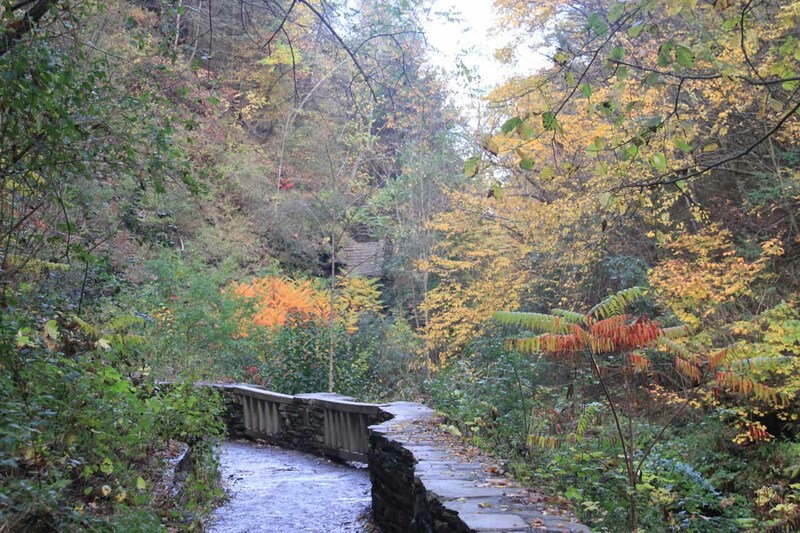 Once I got up to the top of these steps, the trail flattened out momentarily while passing by some interpretive signs. 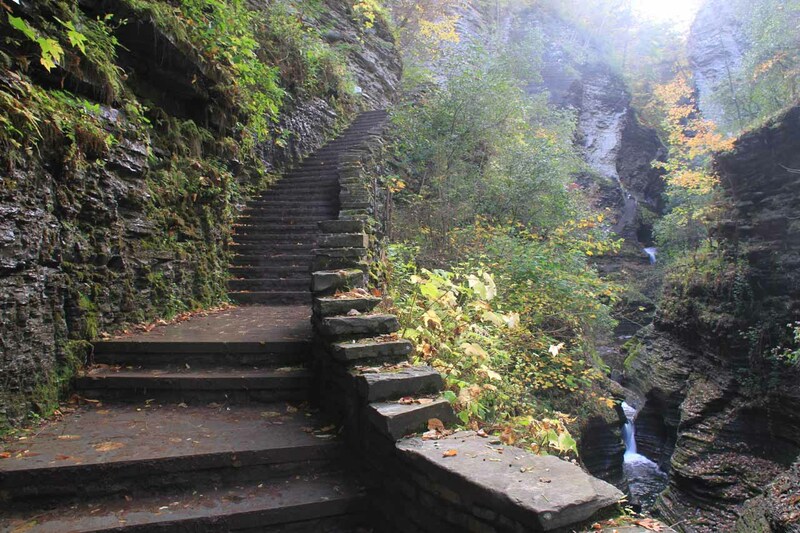 There was another set of steps climbing higher up out of the gorge towards the Lily Pond as well as the South Pavilion Entrance of the glen (according to my map, these steps were the Couch’s Staircase), but I continued on the Gorge Trail towards more waterfalls up ahead. 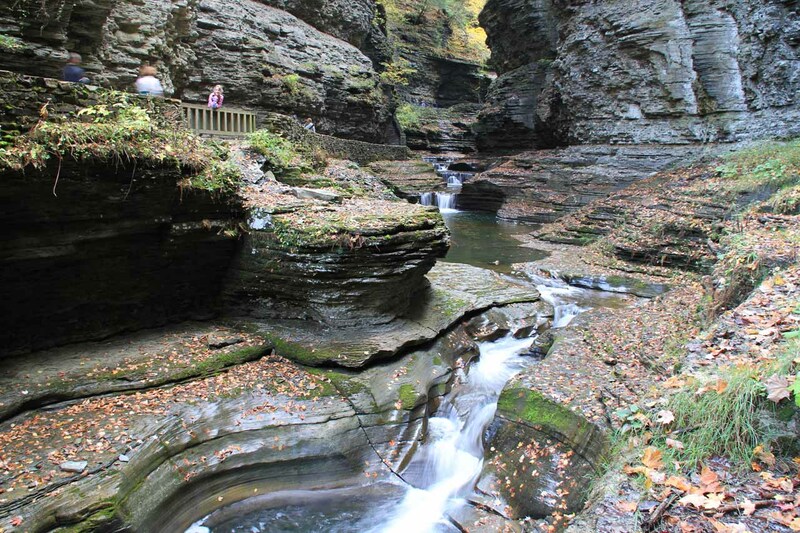 As I got closer to the head of this section of the gorge, I encountered what was called the Cavern Cascade, which featured a plunge as the trail went right behind the falls itself. Immediately after going behind the falls, I then entered the so-called Spiral Tunnel, which was a series of spiral steps passing through a lighted corridor leading up out of the dark depths around the Cavern Cascade. I emerged from the tunnel further up along the Gorge Trail and in a more naturally lit (and less shadowy) part of the glen. From there, I continued along the relatively flat trail past a suspension bridge above me (also leading to the Lily Pond higher up the gorge via the Indian Trail) as I went through section known as The Narrows, which was really a lush section of the glen thereby having its own microclimate that was almost rainforest-like with its cool, shady, and moist environment. As I eventually got past the Narrows, I then encountered the Lover’s Lane junction (0.6 miles from the main entrance by the Sentry Bridge), which would’ve taken me up to that suspension bridge had I chosen to go that way. 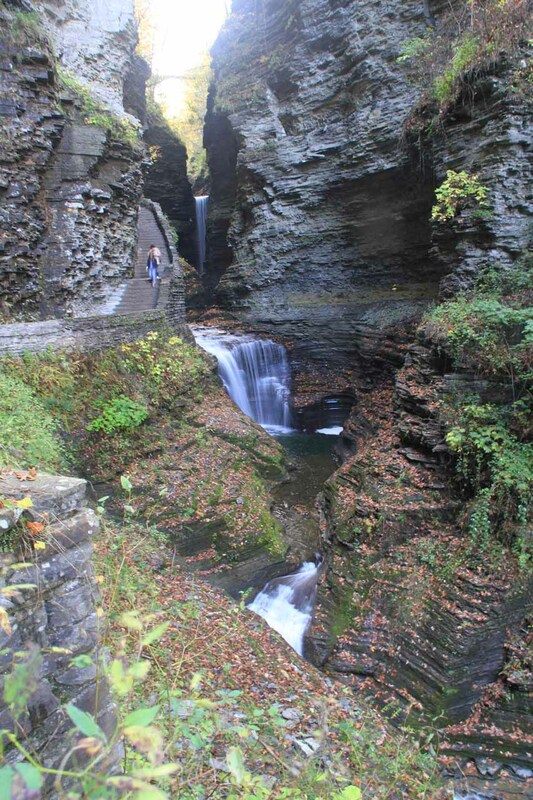 But I persisted within the Gorge Trail through the Glen Cathedral (a fairly open and dry section of the glen) as I approached the 60ft plunge of the Central Cascade. The Central Cascade was said to be the highest waterfall within the gorge at 60ft. 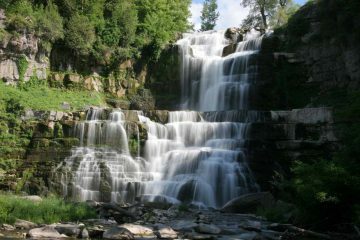 It was certainly a photo-friendly attraction within the glen from the moment I first saw it as I approached it from the Glen Cathedral, and getting to see it from a different perspective near the bridge across its top let me appreciate its tall drop a bit more. 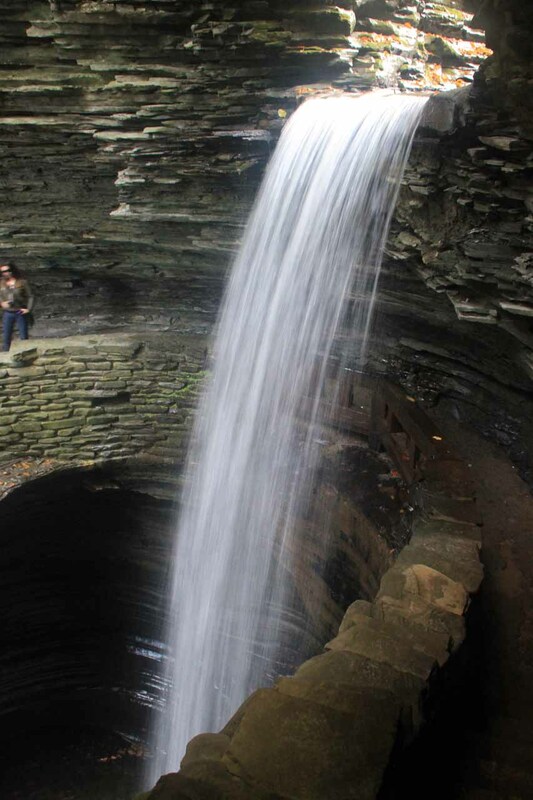 Near the base of the falls were potholes forming little pools. 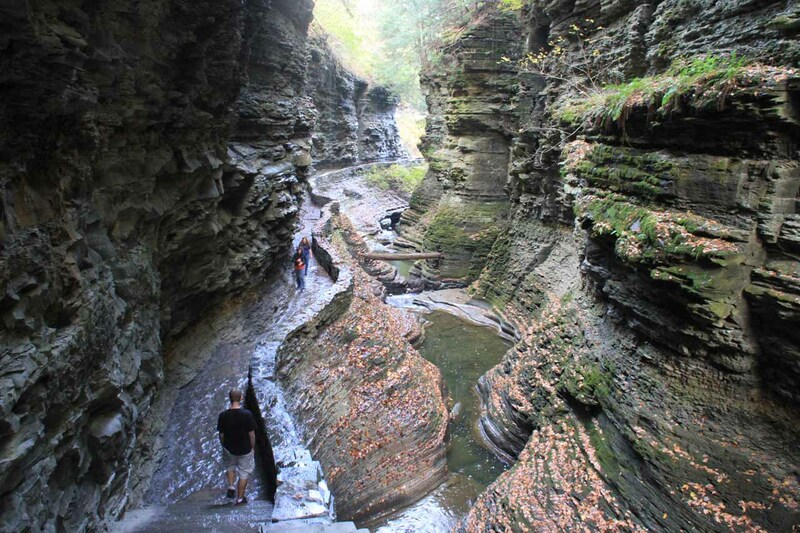 The potholes might have been the result of little whirlpools drilling into the underlying bedrock. 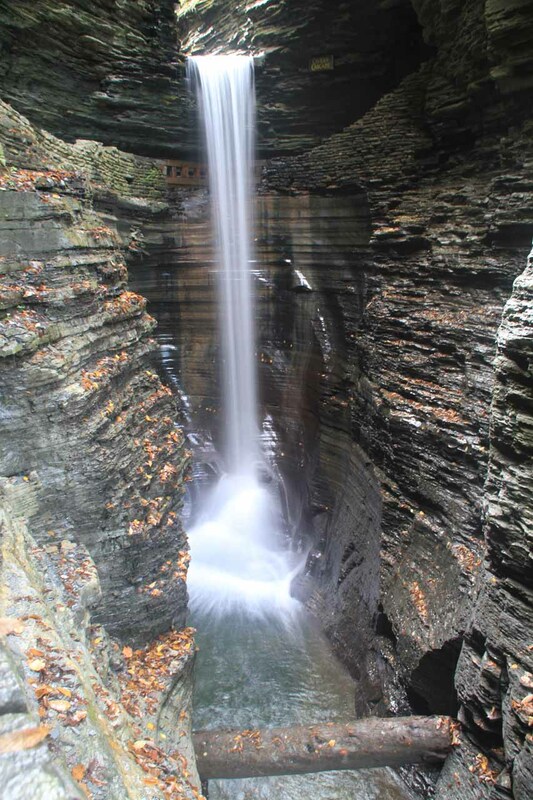 After getting above the falls and onto the bridge above it, the trail then crossed the Glen Creek and continued further up the glen eventually taking me face-to-face with the impressive convergence of waterfalls at the signposted Rainbow Falls. 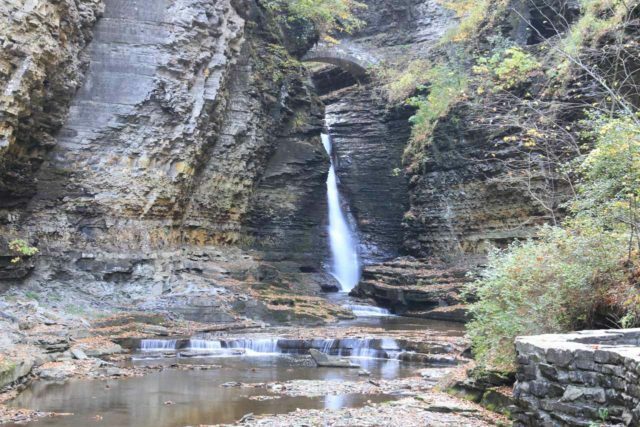 Actually, the Rainbow Falls pertained to the thinner waterfall that the trail let me go behind, while the thicker cascades on Glen Creek didn’t seem to have an official name (even though I tended to think of all the waterfalls converging here as the Rainbow Falls). 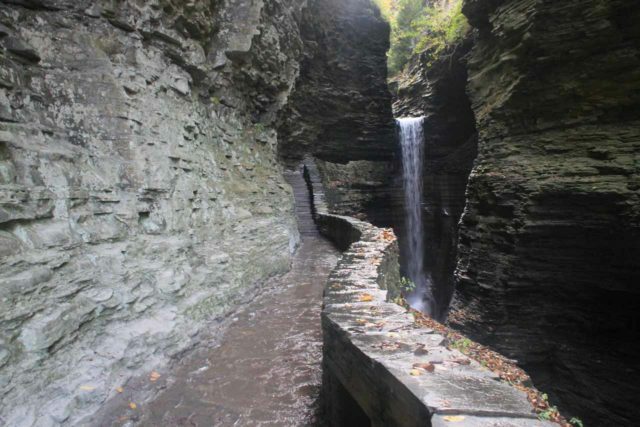 To me, this was the most attractive section (let alone waterfall) within the Watkins Glen. 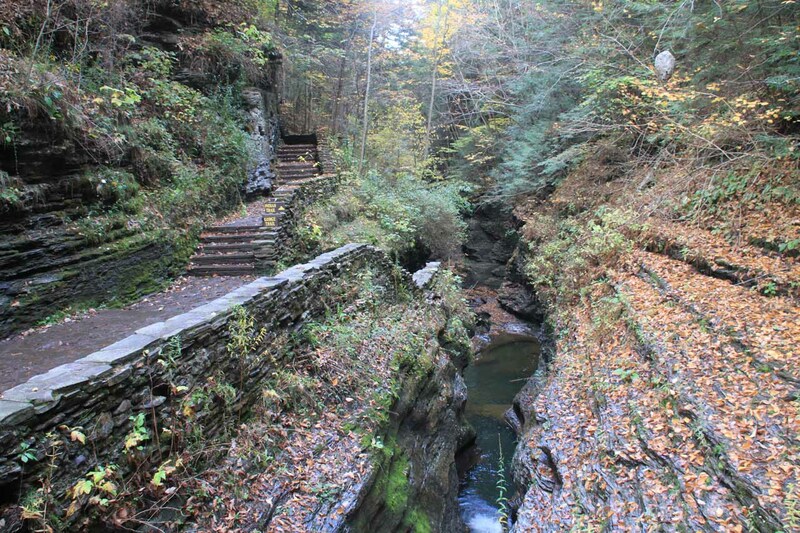 The trail then climbed up steps and once again crossed the bridge over the Glen Creek itself. 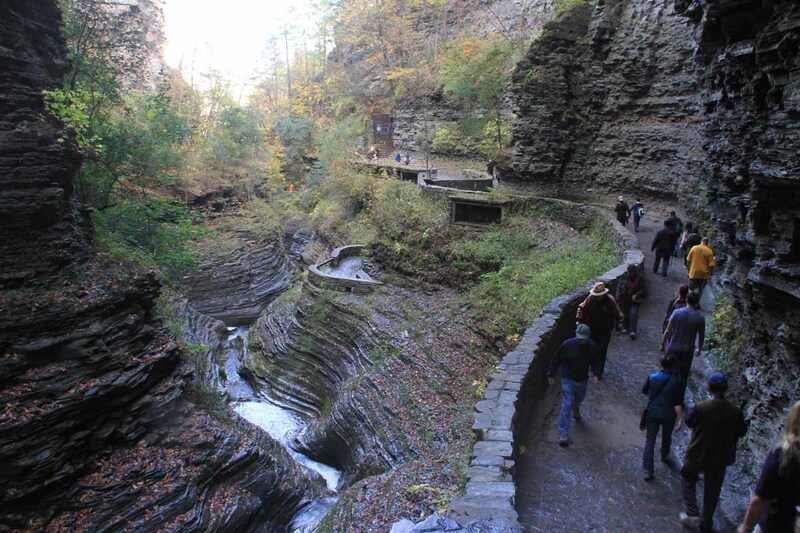 And as I continued hiking further upstream, I entered the Spiral Gorge, which was a dark and narrow section of Watkins Glen that apparently was thin enough to not allow much direct light through here. I could tell how shadowy the section was simply by how blurry my photos taken from here tended to be whenever I didn’t take the trouble to set up a tripod. Given the darkness of this section, it was apparently devoid of vegetation within its depths (other than fallen leaves coming from above). Also within this Spiral Gorge section, it featured a small cascade known as Pluto Falls on the map I was given by the staff at the Main Entrance (when I first arrived at the car park). Unlike the other waterfalls I had encountered while in the glen, this one didn’t appear to have a sign (or at least I didn’t notice any). So I’m kind of assuming that the cascade within this shadowy area was indeed the one named after the Roman God of the Underworld. There was, however, a sign labeled the Frowning Cliffs, but I wasn’t quite sure how it was so named as it wasn’t keyed to any descriptions on my paper map. 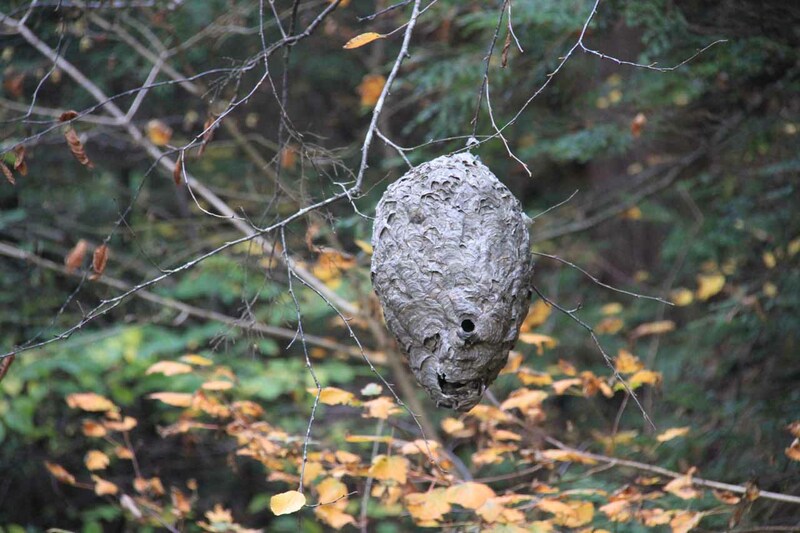 Eventually, I would make it up to the Mile Point Bridge. 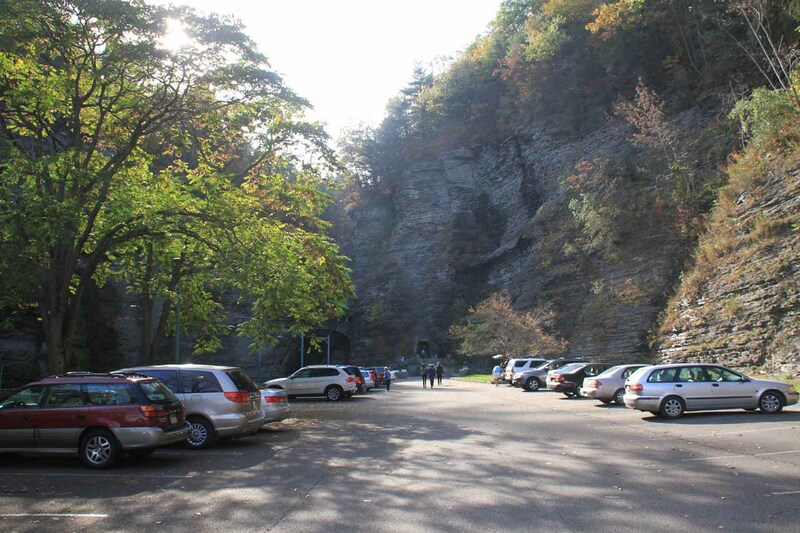 I could’ve continued another 0.5 miles or so towards the Upper Entrance car park, but I opted not to do that since shuttles weren’t available during my time at the glen in October 2013. In terms of scenery, this bridge was kind of anticlimactic and it was really only noteworthy as the landmark that I used to mark the turnaround point of my hike. 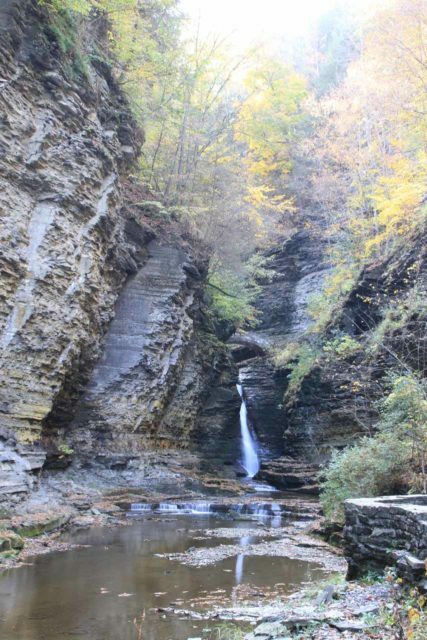 Aside from an interesting weaver bird nest (or some kind of strange bees nest or something), the gorge at this point was shallower than further down the glen, and it was devoid of dramatic sights like the waterfalls or psychedelic geologic formations. Even though I was on my way out from this bridge at around 5pm (with darkness coming in pretty quick), I was still surprised to see a handful of people still hiking in the opposite direction (i.e. 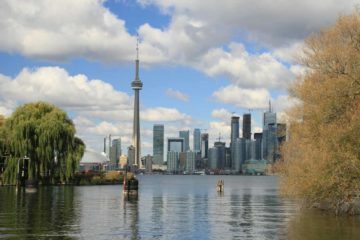 towards the Mile Point Bridge). I guess that kind of attested to the popularity of this place since this was probably dinner time for most people used to the early dinners in America. Anyways, in hindsight, had I not come here so late in the day (starting my hike here at 3:20pm) I probably could have brought Julie and Tahia (who was taking her afternoon siesta) along to enjoy this place. 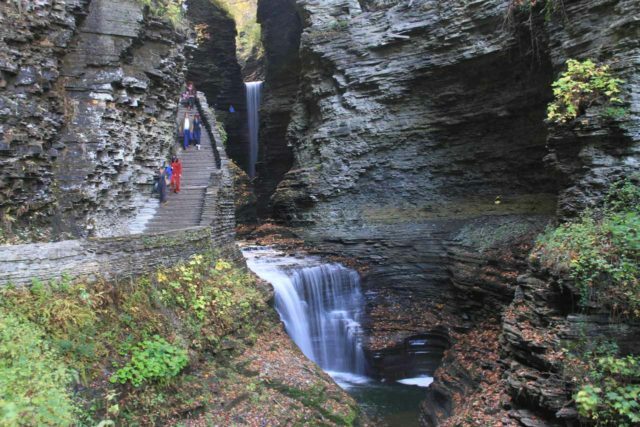 Of course, we would’ve had to keep a real close eye on her so she wouldn’t climb over the stone railings designed to keep people away from the gorge dropoffs. 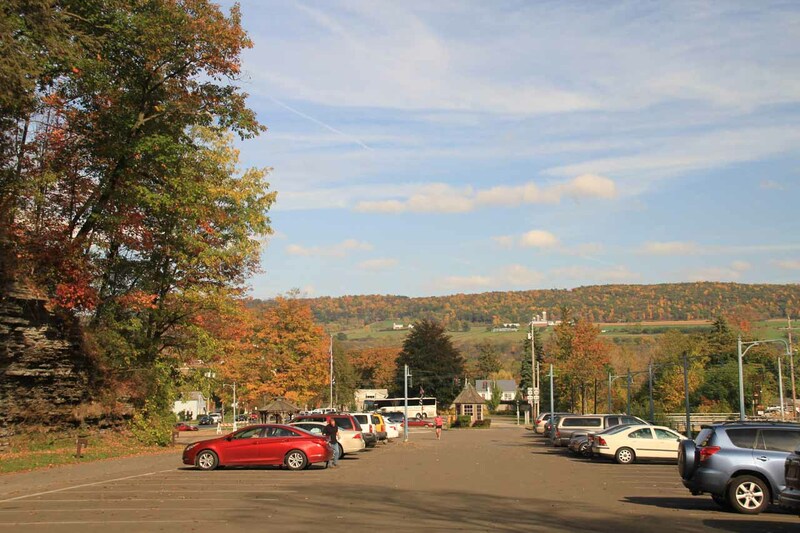 From Watkins Glen Village, drive south on Hwy 14 (North Franklin St) towards the southern end of town. 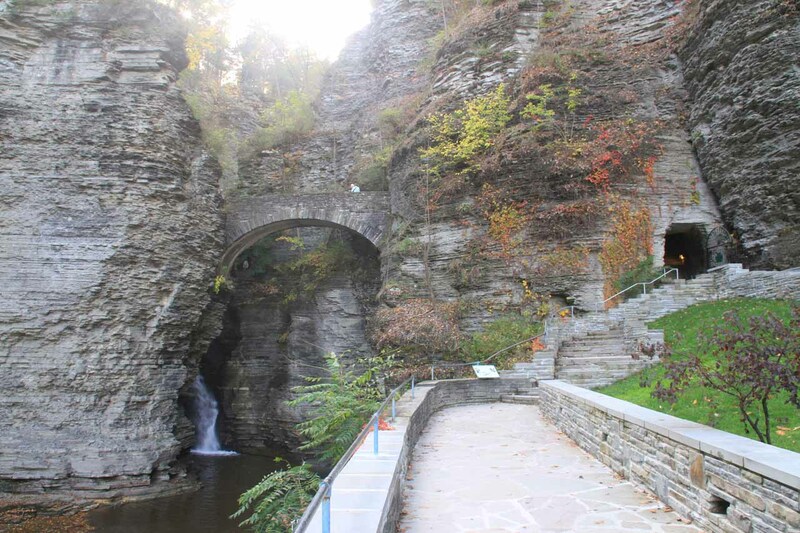 Just before the bridge crossing over Glen Creek was the well-signed Main Entrance for the Watkins Glen State Park. 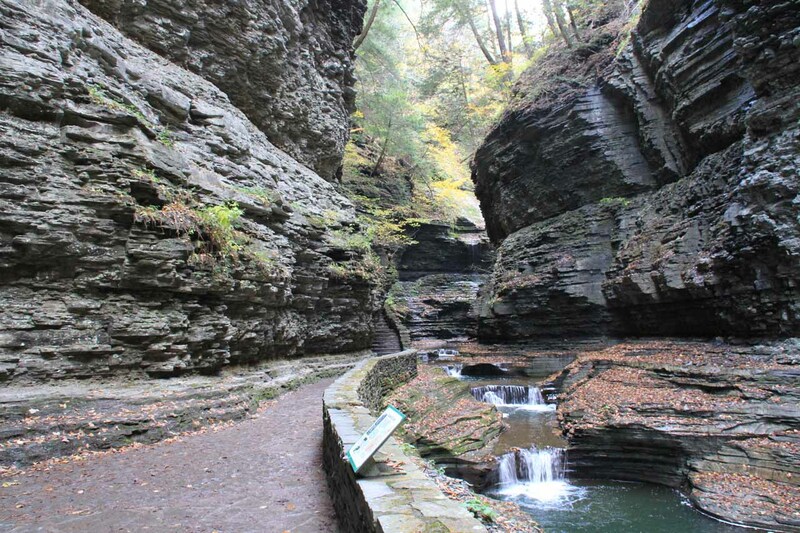 I was fortunate that earlier in the day, I had paid the $8 parking fee for Letchworth State Park, and apparently, that fee I paid applied to all New York State Parks so I didn’t have to pay again to enter the Watkins Glen. 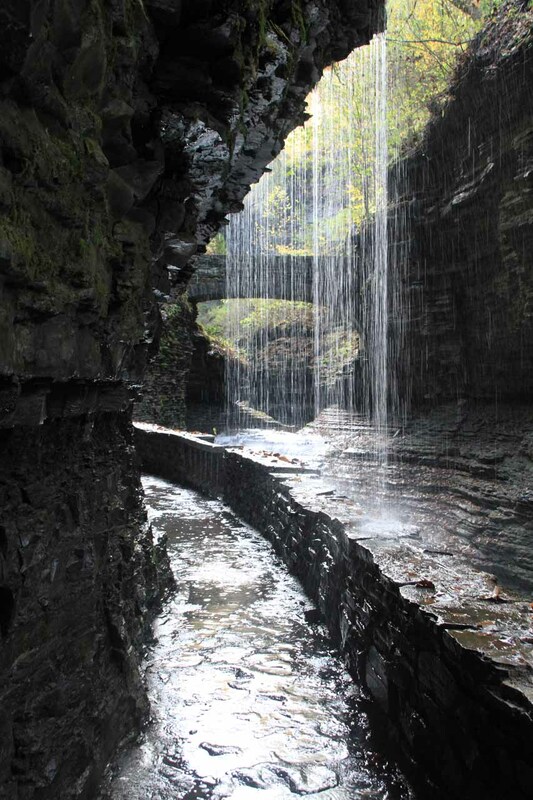 To get to Watkins Glen from Ithaca, we took the Hwy 79 west for about 24 miles (taking over 30 minutes). 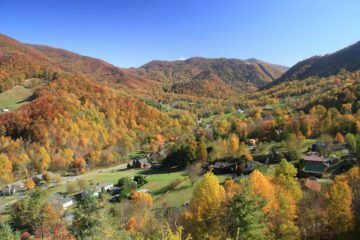 Once we were in the town, we turned left onto the Hwy 14 going south (North Franklin St), then we followed the directions as above, where the entrance to the state park was on our right. 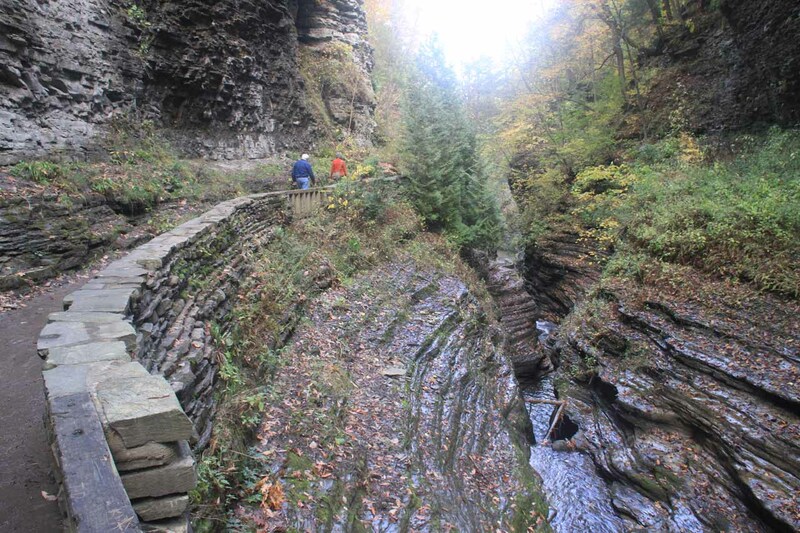 As for getting to Watkins Glen from Letchworth State Park near Portageville, we drove east on Hwy 436 (about 20 miles) to get back onto the I-390 near Dansville. Then, we continued east on the I-390 for about 25 miles to the Hwy 54 exit at the village of Bath. We then followed Hwy 54 (W Washington St; Hwy 415 coincided with this street) for about a mile past the end of the off-ramp then turned left to continue on the Hwy 54 (Liberty St). We then continued for about 7.5 miles towards Keuka Lake before veering right at a fork to leave Hwy 54 and go onto CR-87 (Hammondsport-Wayne Rd) for another 2.8 miles. 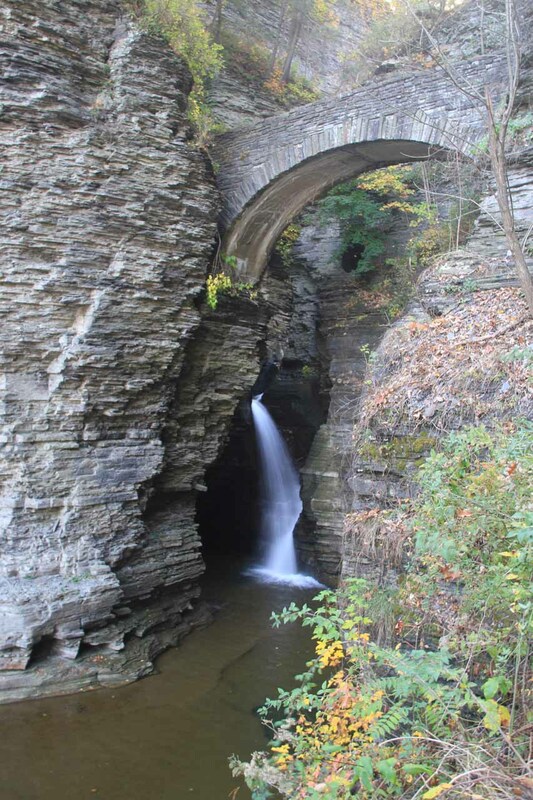 We then turned right onto CR-23, which eventually became Mud Lake Rd after passing by Hwy 226, for another 15.6 miles or so before finally reaching Hwy 14 at the north end of Watkins Glen Village. We then turned right to go onto Hwy 14 and into town where we’d eventually reach the Main Entrance as mentioned above. 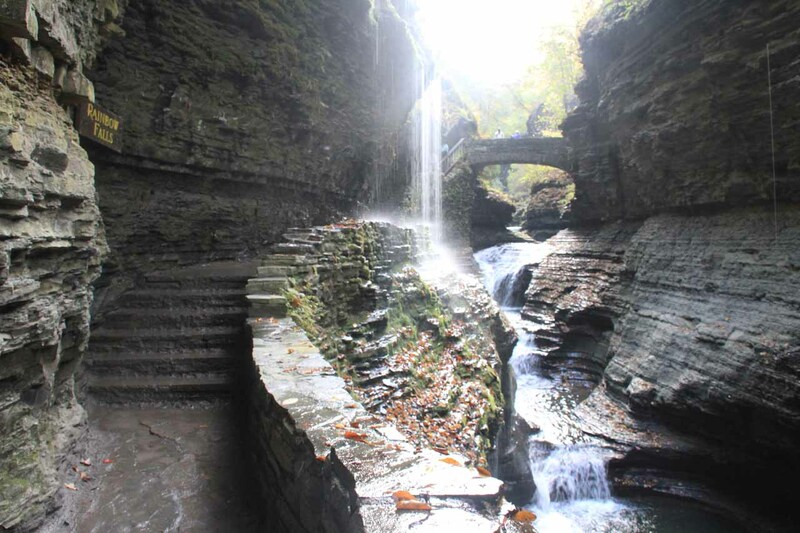 For context, Watkins Glen was 80 miles southwest of Syracuse, 146 miles (2.5 hours drive) southeast of Buffalo, 189 miles (3.5 hours drive) southwest of Albany, and 242 miles (4.5 hours drive) northwest of New York City.